Size Large - Fit for 5' 7" to 5' 11"
Im really glad that I decided to buy this. The material is heavy duty and its easy and fast to put on/off (for me at least). The hood didn't really seem to fit all that great around the top and back of my head and I wish the fabric was more breathable. You can break a sweat just wearing this. All in all, its an incredible item in my collection. the uniform came in perfect condition. only two downsides that I found. one, the hood itself is a bit small and hard to pull down over the top and back of the mask for a good fit and it only has one string tie. two, since the jacket doesn't come with it's own belt to keep it closed, I had to substitute with the longer set of ties for the closing belt for the jacket. wearing them in the front, bring them up through the slits in the bottom of the jacket, crossing each other around the back to tie in a simple double knot in the front. if you order the tabi boots with these, I suggest blousing the boots with the pants, military style. I should have gotten a smaller size but it fits well and I like it. However I forgot to order the boots and socks. The quality is good in every thing but the cheap balaclava, but I have a tactical half mask I use instead. One of the gauntlets finger loops broke but I tied it back no problem. 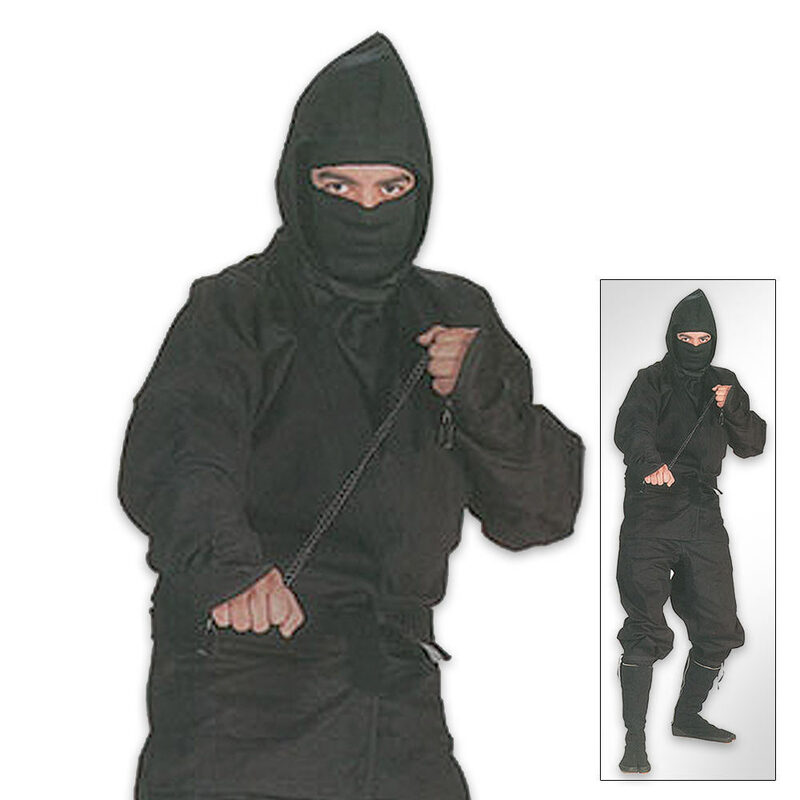 i ordered this but got the kung fu one instead......i mean dont get me wrong its still well made and all that, but i want the freaken "NINJA" one, you know japanese not chinese :T pfff guess ill just rebuy it and if it happens again ill just look elsewhere. but this is still a good site for purchasing weapons and what not. i purchased mine several months ago and it still has an amazing condition. it is extremely easy to move around in as well as it having an extremely comfortable texture. some times the straps come undone revealing my bare chest. which was resolved in wearing a black undershirt along with it. my cousin says he doesn't even see me at night in it. when i'm two feet to the side of him. a great buy and i recommend getting some Jikatabi boots to go along. and dont forget about the Tabi socks. Very Badass, No lie. I used it for Halloween this year and scared some of my friend by silently disappearing and reappearing behind them. Great quality material, just needs the Tabi. love the uniform a little confusing on how to wear at first but definatly worth it i wear it almost all the time.